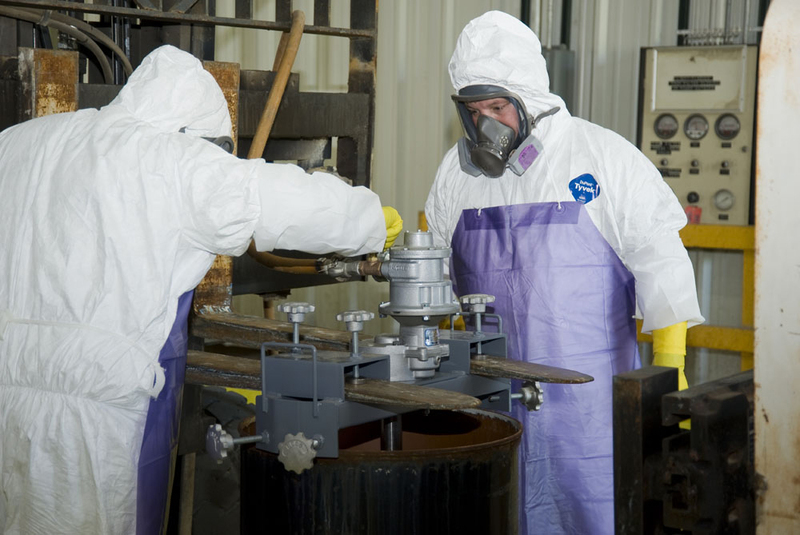 The above photograph is part of the early work removing “legacy materials” from the Alpha-5 (9201-5) Building at the Y-12 nuclear weapons plant in Oak Ridge. The workers are solidifying contaminated mineral oil to prepare it for disposal. The project is one of seven cleanup projects at Y-12 funded by the Recovery Act. Alpha-5 is a 1940s-era facility that has been used for multiple production functions since its original mission in enriching uranium for atomic bombs. The building once housed some of the COLEX operations that used massive amounts of mercury to produce the lithium needed for thermonuclear weapons (H-bombs). It also has been used for various uranium and beryllium operations during the Cold War weapons work at Oak Ridge.. The current cleanup project is intended to remove materials left from these former operations and help prepare the big building — 613,000 square feet — for eventual decommissioning and demolition. John Krueger, the project chief for B&W, the government’s contractor at Y-12, said the work at Alpha-5 is ahead of schedule at this stage. This entry was posted in Y-12 on August 20, 2009 by Frank Munger.